About Long's Auto Body inc.'s frame shop. Long's Auto Body Inc. uses state of the art frame repair technology to repair your vehicle back to factory specs. 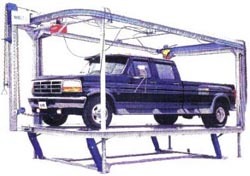 Our DUZMORE frame rack is capable of pulling virtually any frame or unibody vehicle, and when incorporated with our Accutrak measuring system there is no room for guesswork. Long's Auto Body Inc. also uses Pro Spot spot welding equipment to put your vehicle back together the same way it was assembled at the factory. We are also equipped with a Hansen overhead mig arm as well as a Solar portable mig welding systems.